Just in time for the Wimbledon season, Mario and friends hit the courts on Nintendo Switch in Mario Tennis Aces. This refined tennis experience comes packed with the usual tennis gameplay, plus a brand new adventure mode, which tells the tragic story of how Luigi became possessed by a most evil tennis racquet. True tennis meets the zany quirks from Mushroom Kingdom once again! Does Mario Tennis Aces serve a Mario tennis experience without a fault, or is it just a backhanded bore? Find out in our review after the break! Three years ago, Mario Tennis Ultra Smash was released for the Nintendo Wii U. The game felt rather uninspiring as far as Mario Tennis goes, with the lacking single player experiences and uniquely Mario gimmicks, though it still had some brilliant core tennis mechanics. Mario Tennis Aces improves on nearly every aspect of Ultra Smash. Booting the game up for the first time will instantly launch you into a post-game celebration at Marina Stadium. The celebration is crashed by both Wario and Waluigi to offer a special ‘present’ to Mario and Luigi, a mystical tennis racquet from the Bask Ruins, Lucien. Turns out it’s an evil racquet that soon possesses Wario, Waluigi, and poor, poor Luigi. What’s worse, the Racquet sends them to the far reaches of Marina Island (the island isn’t actually given a name as far as I am aware) to claim the five power stones to fully restore Lucien’s power and take over the world! It’s up to Mario, accompanied by Toad, to scavenge those power stones before Lucien’s minions, as well as seal the racquet before it’s too late. Adventure mode does a pretty decent job introducing all the mechanics of the tennis court in a couple tutorial matches. There are also even more hints and tips detailed in the ‘How to Play’ section on the main menu which is worth reading through. All the regular shots are there. The topspin spins forwards and bounces high, the slice flies low with a semi controllable curve, the flat shot flies extremely fast without any spin, the lob shot bounces very high to the back of the court, and the drop shot bounces low to the front of the court. You can also charge shots up in an attempt to push your opponent back a bit, though these can also be countered to significantly reduce knockbacks. There are several new techniques introduced in Aces: trick shots, zone speed, zone shots, and special shots. Each of these shots require energy to use, which can either be increased by continuing long rallies, or by performing fully charged shots. Trick shots are great for returning hard to reach shots while adding some added finesse. Be careful though, a poorly timed trick shot will not only cause you to miss the ball, but also loose a bit of energy. When the ball flies over a star icon on the court, you could perform a charged flat shot to return the ball at extreme velocity with a star shot, or you could perform an even more powerful zone shot. Just press R at the right time to leap up and slow down time, then you can aim and smash with great accuracy. Even if your opponent is able to return this shot, if they swing too early or too late, their racquet will take damage, and may even break completely. You will, however, need to have at least 30% energy to pull off this move. Too far away from the ball for a trick shot or having trouble timing a zone shot block? Then why not activate zone speed which slows down the passage of time, making it easier to reach the ball or block powerful shots. Slowing time is pretty exhausting though, so be sure you have a good amount of energy stored up. Finally, if you’ve fully charged up your energy meter, you’ll be able to unleash your powerful special shot. This is essentially very similar to the zone shot but with more razzle dazzle and a lot more power. Even if an opponent tries to block this shot, if they are too early or too late, their racquet will break no matter what condition it is in! Oh, did I mention that, once you’ve run out of racquets, you will automatically forfeit the match? All of these new techniques can really overturn a game. Though some of these are high powered techniques, the game does a good job to balance them out so you have to work to be able to perform the shots and that there are ways to counter them too. Back in adventure mode, you travel the different regions in a New Super Mario Bros. format, going from location to location to tackle various opponents and tennis themed minigames. The first couple regions can be completed fairly easily, however the difficulty quickly spikes, which forces you to perfect your tennis skills. Though there were plenty of times later on in the adventure where I’ve struggled to advance, it felt great when I finally beat that stage. If you are finding a particular stage difficult, you can actually level up Mario by replaying stages to increase your stats, such as speed and accuracy. Sometimes refining your skills can give you that advantage on the court. Some of the minigame stages are fairly creative throughout adventure mode. One stage is set in a haunted mansion where you are opposite a massive mirror which has bubbles floating around it. To complete the stage, you have to find the ‘real’ bubble, and then hit it with a zone shot while each wave becomes more difficult. To be able to tackle this challenge, you need to be able to aim your shots accurately, as well as utilise the ways to fill up your energy meter. Adventure mode also unlocks a range of different courts, they may not be as exciting as the courts in Mario Power Tennis (still the best Mario Tennis game in my eyes), but they are still pretty awesome, as well as very good looking! Mirage Mansion includes mirrors that float above the net, if you hit a ball through a mirror, the other mirror will spit the ball out right back at you. Another court, Savage Sea, has a ship mast right in the middle of the court which can deflect the ball, forcing you to think on your toes. Mario Tennis Aces sees the return of the traditional Tournament mode, something which fans sorely missed in Ultra Smash. The offline tournament mode lets you compete in three difficulty levels against the AI on the basic courts: hard, clay, or grass. You can, of course, try your hand at some online tournaments too. These essentially work the exact same as the offline tournaments, but this time you will be pitted against real people online. Additionally, participating in the monthly tournaments will unlock a playable character up to a month early. There are two classes for online tournaments: standard and simple. The standard class is good for those who have perfected those zone shots and blocks, as this class will enable all mechanics and techniques that Mario Tennis Aces has taught you. On the other hand, simple class retcons all these techniques, making it the perfect test of your raw tennis prowess. For the most part, the online aspect has been a fairly smooth experience, though if you or your opponent doesn’t have a great connection, do expect a bit of lag. Matchmaking is actually pretty decent for online tournaments. Instead of being placed into one lobby, the game searches for an opponent for you who is in the same bracket, meaning that, theoretically, the further you go in a bracket, the tougher your next opponent will be. Unfortunately, a lot of opponents I have played are pretty skilled, so it may be a good idea to get a bit of practice in offline play before hitting the big leagues. Who knows though, maybe you could catch onto some good techniques while being utterly thrashed online! If you want to just play for fun, without too much serious competition, you can try out Free Play. This mode can either be played against computer players, or other people on the same console, locally, or online. There’s also a range of different options you can set, such as whether you want to play singles or doubles, whether or not you want to play with the standard or simple rules (like in tournament mode), and the computer difficulty, you could even opt for a quicker game by just playing up to six points. There are a couple of concerns however. First of all, there’s no option to select which court you want to play on. Instead, a court is selected by random from a list of unlocked courts. Though this list can be customised, even to the extent of turning off hazards completely (which is a plus for the purist tennis community), it would still make it a lot easier to include a court selection screen, with the option of having them randomly selected. The biggest issue with free play however, is the fact that that a full game only consists of one set of tennis (best of three games), there is no way to change how many sets to play. Sometimes it would be nice to be able to play a full three sets of tennis; if you can play more than one set in Wii Sports, a twelve year old Wii launch title, why can’t you do so in the most recent entry of Mario Tennis, it doesn’t make sense! Speaking of Wii Sports, do you ever miss the motion controls from Wii Sports Tennis as much as I do? Well, get ready to ‘accidentally’ whack your mates round the head with your JoyCon in Swing Mode. This mode is very similar to free play, but with a few differences. The most notable of all is the fact that the mode is played entirely with motion controls using a singular JoyCon. Depending on how you swing your JoyCon, including the flicking of the wrist, will determine the type of shot, as well as the direction. Though it may not provide the most accurate aiming, using motion controls is still a barrel of fun, and perfect if you want a bit of a laugh with some mates during the tennis season. The other difference is the fact that the mode also uses the simple ruleset without any court hazards. Though it’s probably for the best to keep it simple, I still think it would be interesting to include some of the other gimmicks as a non-default option to make matches even more hectic and fun. Mario Tennis Aces improves just about every aspect which fans found disappointing about Ultra Smash. Tournament mode makes a triumphant return which is accompanied by online tournaments with decent and quick matchmaking. 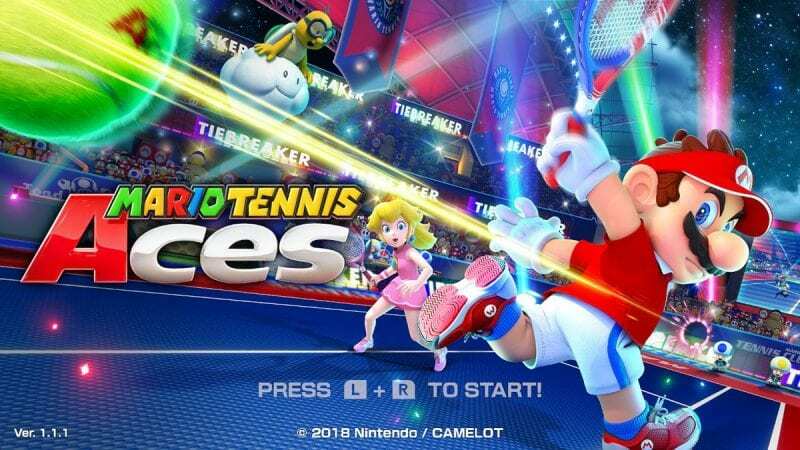 The title also comes packed with an extensive single player experience which does a good job of honing in your tennis skills, a incredibly fun mode that solely uses motion controls, as well as brand new powerful techniques that help to vary the gameplay further. The game can also still appeal to the tennis purist as almost all modes allow you to completely remove gimmicks from the court. Unfortunately there are a few decisions that honestly make no sense, such as not being able to determine the amount of sets to play in free play, though luckily this isn’t enough to deter me from the title. I do still wish that some of the hazards and minigames from Mario Power Tennis would return though; I still have fond memories of logging many hours into Gooper Blooper Volley! For obvious reasons, if tennis does not interest you in the slightest, no matter how much Mario is included, then it’s probably for the best to give this a skip. If, however, you’ve loved all the previous Mario Tennis entries, or are looking for an exciting tennis game with some neat gimmicks, then I’d fully recommend Mario Tennis Aces! Mario Tennis Aces is out now exclusively for Nintendo Switch!